This is a spicy salsa! A kick of flavour…to your mouth. You’ve been warned. Ingredients: Tomatoes, Water, Cider Vinegar, Tomato Paste, Onions, Green Peppers, Evaporated Cane Juice, Corn Starch, Salt, Spices, Dehydrated Garlic, Habanero Peppers. Best hot salsa out there. Lots of heat. Lots of flavor. If you or someone you know appreciates spicy stuff, this is what they need in their life. Soooo good! My favorite salsa of life. Ordered for husband. His mouth was on fire. He loved it and I got a good laugh. 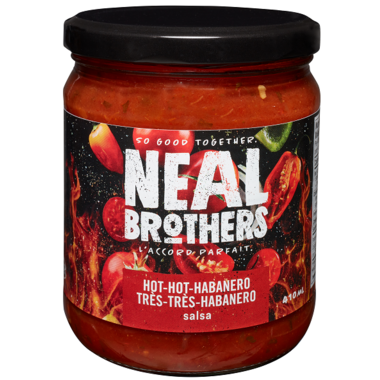 I bought this for my husband because itâ€™s hard to find HOT salsa in our area. He really enjoyed it, said it not only had heat but it had flavour. 5 Stars! I found the vinegar flavour over-powering in this salsa! I much prefer my homemade salsa. This is the most spicy salsa I've tried. I keep purchasing this only. My favorite salsa. Super spicy with great flavor! One of the best salsa's I have ever had. Definitely has a lot of kick but also has so much flavor! This will be a staple in my pantry for sure. My new favorite salsa! Great taste and packs a punch! Very spicy salsa yet flavorful, my husband and I cannot stop eating it. You can tone it down by adding ingredient to it easily, such as pineapple or grape tomatoes.